"Sharing in your sadness as you remember Janice Harvey." "You are not alone in your sadness for your loved one meant..."
"A lovely lady who will be missed by so many." "A friend forever! I loved you like a sister! 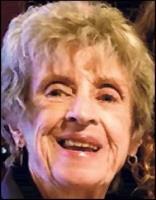 Ruth Harbaugh"
Janice Harvey, 79, passed away on Wednesday, September 19, 2018 at her home in Washougal, Washington. Janice was a 20-year breast cancer survivor and recently it metabolized to her liver. Her family was with her at the time of death. She had Hospice help the last four days of her life. They made her comfortable and worked closely with the family during her last days. Janice was born in Elma, Washington July 6, 1939 to Joseph and Marie Hall. She had a brother, Joe Hall Jr. She attended Clover Park High School in Tacoma, Washington and graduated from San Francisco State University. After graduating from college, Janice was a school teacher in California. She married Dennis Harvey March 4, 1972. They had a daughter, Shannon Harvey. Shortly after Shannon’s 4th birthday, Janice and Dennis made the decision for her to manage the home and family and leave her teaching career. She was very traditional and felt that mothers should stay home full-time, if possible, and support their husband’s career and raise their family. Janice has lived in Oakland, California, Grants Pass, Oregon, Vancouver, Washington, Camas, Washington and moved to Washougal, Washington in 2010. Janice loved the outdoors and spent many days camping, fishing, bird hunting, river rafting, and traveling. She was a volunteer to her community all of her life. PTA, Barnstormers Theater, A.A.U.W. and Friends of Hospice of Southwest Washington, just to name a few. Janice loved playing bridge and played four times a month. In addition she was a life long Quilter and made many quilts for friends and family. She was passionate about the outdoors and preserving our environment and was the ultimate recycler. In 2010, she designed their home in Washougal, which was given the top award from the U.S. Building Council in Washington D.C. for the most environmentally friendly and sustainable home in Southwest Washington. On September 11, 2018 Janice was awarded a Lifetime Membership from the Friends of Hospice of Southwest Washington. She was on the original committee 24 years ago when it was formed. In addition, she was a member of AAUW for 42 years, whose mission is to provide college scholarships for women. Janice is survived by her husband of 47 years, Dennis Harvey of Washougal, Washington; her daughter, Shannon Lester, her husband, Andrew Lester and her two grandchildren, Rachel Marie Lester and Zachary Scott Lester of Powell Butte, Oregon. She is also survived by her step-daughter, Diana Harvey, her husband, Ken Nordgren and their granddaughter, Makayla Nordgren of Esparto, California. Janice chose to be cremated and will be buried in the family plot at Mountain View Cemetery in Tacoma, Washington. She will be buried next to her Mother, Father, Brother and Norman Harvey and Helen Harvey. No funeral services will be planned. There will be a Celebration of Life for Janice in Washougal and a private family graveside service at Mountain View Cemetery in Tacoma. The time and date will be announced in the future.